The non-profit organization Norte began shortly after founding members Ty and Johanna Schmidt moved to the Traverse City, Michigan area from southern Arizona. They became motivated when they saw a lot of traffic at school gates, and so few kids on bikes. In a bid to help, they started offering neighborhood families another option – “Drop your kids at our place and they can join us cycling to school.” In no time at all the numbers began to grow. Inspired by the fun they saw the kids having, Johanna and Ty reached out to friends to set up similar bike trains in other neighborhoods. From this, Norte was born. Norte is governed by a 9-member board and dedicated support team. Between them, they organize 18 bike trains connecting 9 different neighborhoods to 12 Traverse City schools. 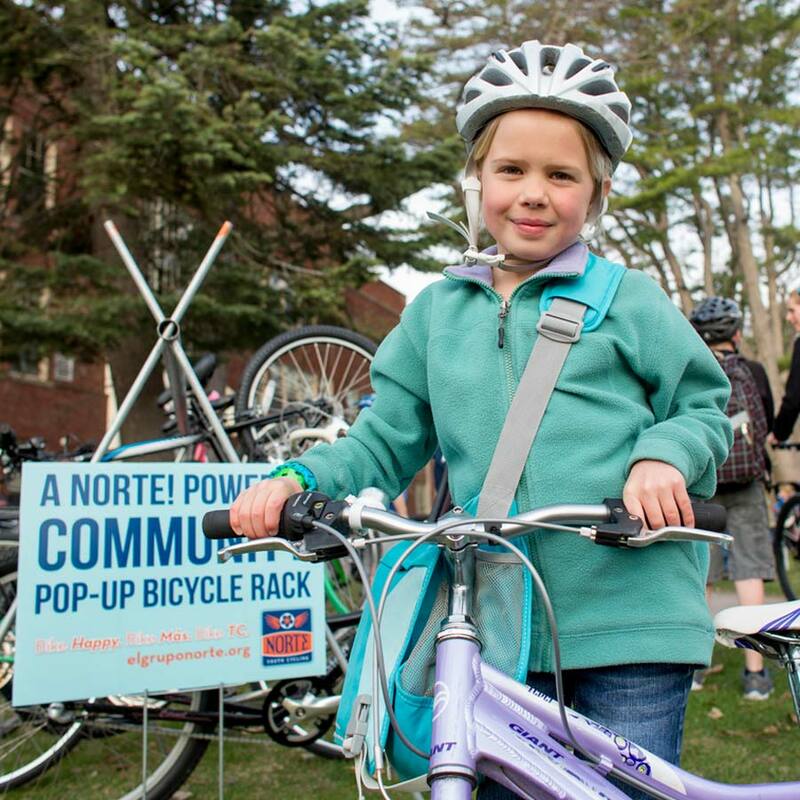 Expanding far beyond their original plans, Norte now run several different programs: Safe Routes to School, Pro Walk/Pro Bike Advocacy, Youth Empowerment, Mountain Bike Clubs and Coaching, plus events throughout the winter to keep the town cycling year round. Snack themed rides. Kids love bikes but kids REALLY love snacks! What Does Norte Aim to Achieve? The core goal the non-profit is to get more kids on bikes. The combined efforts of Norte cover all ages and aspects of bike life in order to appeal to, motivate and educate as many people as possible. From teaching the youngsters starting out to ride with the ‘Estrella’ group on balance bikes, to teaching the older kids how to wield a spanner and fix their own set of wheels with ‘The Solucion’ classes. The formula is to get kids hooked by showing them what they will gain for themselves thorough riding bikes. The independence, freedom, and above all fun of being active and playing outdoors with friends. Ty spoke about how through running the clubs, he has seen the way bikes build youths confidence and teach them a grittiness to persevere when they fall or become tired on a longer ride. 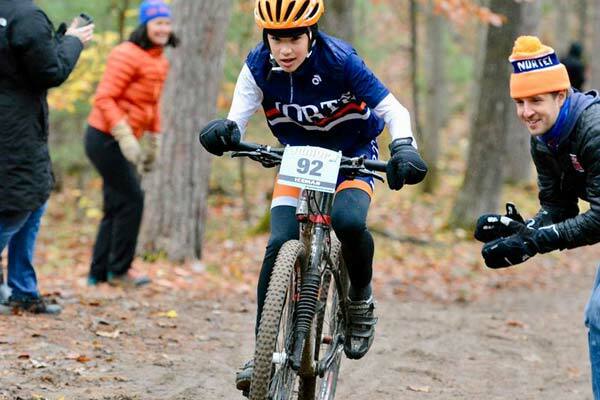 Since the start of Norte, many kids have progressed from barely being able to ride 4 miles – to now competing in cross-country races of up to 30 miles. In the town’s recent ‘Iceman’ race which saw 5,000 people competing from all round the country, Norte had 60 kids from their teams racing. 15 of which were taking part in the 30-mile race. Though Norte has grown into a thriving club now, it hasn’t always been a smooth ride. Ty wasn’t shy to mention that with what they know now there are many things they would have done differently. He believes that a strong factor in their success has been the way they have branched out to offer many things. With the benefit of hindsight, here are Ty’s 3 top tips to anyone wishing to start a similar venture. Make friends with like-minded awesome people in your community – You can’t do it all on your own. Be consistent – set a time that rides will take place and stick to it no matter what. Build a reputation of reliability. 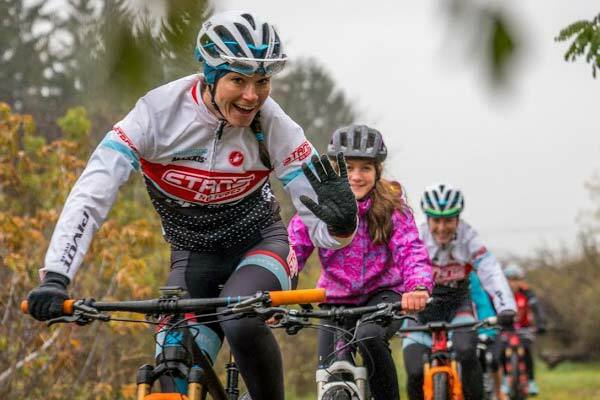 Make the rides all about family time – families are more likely to commit to becoming part of something if it’s an activity everyone gets involved with and enjoys. 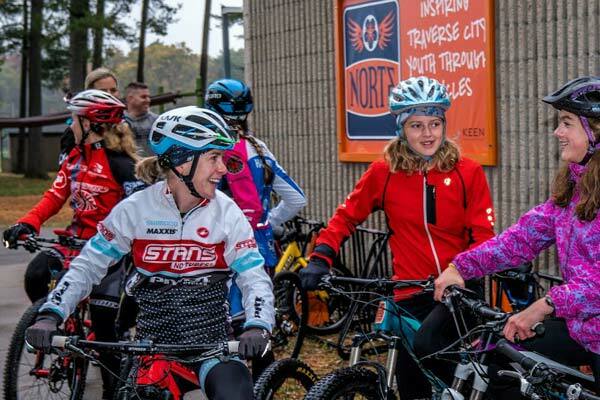 While Norte are already seeing impressive numbers of kids at their rides, with up to 100 riders on a Sunday and 30/35 at the after school clubs, Ty aims to see this figure double in the future. He is also always keen to help other communities build their own cycling programs and is looking to produce material that can help with this. There were mentions of a ’10 Ways You Can Do What We Have’ type guide. In the meantime, if you would like any advice from Ty he is more than happy to help in any way he can. The best way to get involved is through the contact page on their website. 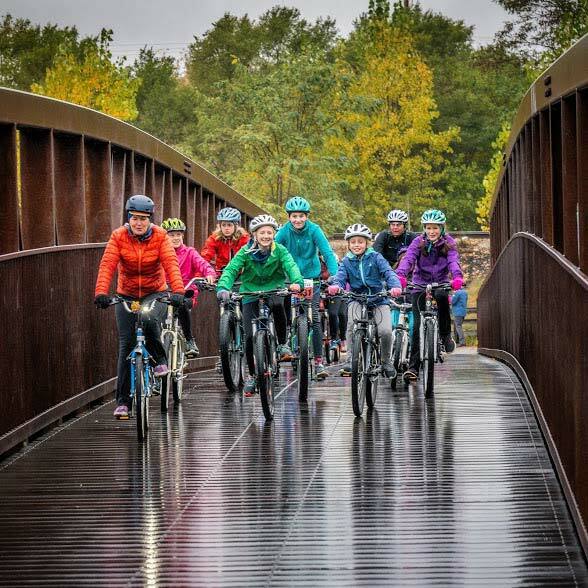 Despite only being a small town, Traverse City is a thriving community of outdoorsy people who really embrace the enjoyment of an active life all year round. Ty was full of praise for the way the town has believed in the project from the beginning, rallying behind every new campaign and getting involved in all the events they held. Ty felt confident that given the chance many other cities would also do the same. Despite Ty’s constant claims during our chat that ‘They aren’t anything special’ it’s quite clear that his enthusiasm for what he does has played a large part in getting this project off the ground. The enjoyment and reward he gets from seeing the kids improve and grow as people is genuine. His sense of pride in what they have achieved is tangible and rightly so. What Norte have done for the kids of, and Traverse city itself, is impressive. I hope other people can see what they’ve done and feel inspired to follow their lead building a healthier future for the next generation. Becky Parker is a Freelance Writer based in the valleys of South Wales, UK. She enjoys all things trail based be it walking, trail running or mountain biking, as long as it involves exploring the mountains, she’s happy. Over the last summer she has dabbled in a touch of enduro racing and has discovered the competitive streak is strong in this one, provided the race tape is leading purely down the hill! Visit Becky’s blog at www.runridewrite.com.